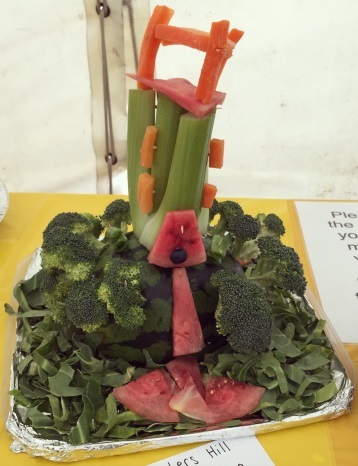 This year’s Make Merry takes place on Saturday 10th June and, besides running the Information Tent, Art Plumstead will be organising the popular Fruit & Vegetable Sculpting Competition. The entries will be on display in the Information Tent, where visitors will be given the opportunity to vote for their favourites. The theme of this year’s competition is “Plumstead People and Places“, so sculptures of local landmarks or local people past and present please and it is free to enter. However, anyone wishing to enter must contact Art Plumstead using their form which can be found at the bottom of their webpage https://artplumstead.wordpress.com/ before midday on Friday 9th June to reserve a place in the exhibition and entries must be delivered to Dee Goodwin at the Information Tent between midday and 1pm on 10th June. Note: It may be possible to deliver earlier by prior arrangement. Voting will be open to all members of the public from 1pm and prizes for 1st, 2nd & 3rd in the competition will be announced and awarded after 4pm on the day. So get thinking, get sculpting and use your “five a day” wisely. Severndroog Castle – edible version. Previous Post THE MAKE MERRY NEEDS YOU!